There was only one reason why I had managed to travel all the way to London, Ontario, and it was a Harry Potter themed festival that was the main attraction for the two and a half hour journey by Greyhound bus. Ironically there was a flight, albeit short from Pearson airport in Toronto to this part of Southwestern Ontario, but there were simply not enough crude oil reserves in the world to justify the ridiculous price that was set by Air Canada in order for that option to be feasible. Boy, did we make the right choice; travelling by bus is definitely a very individual taste, and some people may be completely turned off by the fact that you're heading hundreds of kilometres west on a vehicle that is born to be cramped and a little inconvenient. Although this form of transportation lacked any additional services or even sufficient leg room for that matter, it was the vistas that kept the spirits up and I travelled with a sibling along with a couple of friends in order to add to that pleasure. One thing's for sure - you'll miss the beautiful rolling countryside that Ontario still offers if you're busy at the wheel, or up in the air. 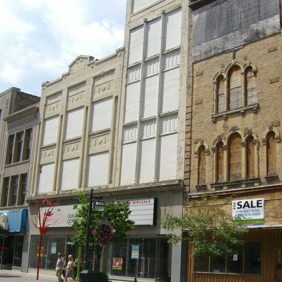 London, Ontario is a small city, but it was born in the nineteenth century as the potential new capital of Upper Canada, but the forests and the woods had resulted in such an inaccessible location that Toronto (formerly York) was eventually chosen instead. The Thames River reminded early settlers of the River Thames in the original London (Great Britain), and this city still maintains its natural reputation with plenty of parks and natural life. The original anticipated capital of Upper Canada. Let's be very frank: The original motive of my trip to London, the festival that was devoted to Harry Potter, was less than stellar. I'm not trying to offend anyone of this enchanting book by J. K. Rowling, but it was a hot August day and everything else looked so beautiful, that anything else was practically irrelevant in my eyes. I left the event early to head into the centre of the city, wanting more of the leafy green forests. What really stood out in my opinion is the fact that there is so much greenery, especially downtown. You're never more than a ten minute walk from a recreational area or a park that could delightfully add to the common stroll, and I took many photos of the civilised wilderness that is such an integral part of London's image. It was a very friendly experience that really shows that you don't need to venture out of the country in order to experience something different. Yes, this city has its blemishes and less than stellar sides, and I did see a good amount of suburbia as I strayed away from the main areas - my hotel was in the middle of a strip mall, and was conveniently located about a ten minute walk from the White Oaks Mall, another suburban joint. But what really drew me in when I visited the city was its simple, no nonsense image. London, Ontario is about two and a half hours away from most parts of Toronto and its suburbs, depending on your method of transportation - cars may get there faster due to borderline illegal speed, while coach buses may be a little slower due to stops along the way and the general schedule. Closer to Home features some unique and popular destinations that are within driving distance of the Greater Toronto Area. There is much to discover, even if you venture within your community - and that is the point of this section.